100% of the proceeds from the sales of Late Night With Andres will be donated to assist in the battle against breast cancer. Scroll down to enter the phenomenal giveaway with tons of prizes donated by authors and bloggers! Rising-star blogger Milla Kierce knows she’s arrived when she sees the swag basket in her dressing room on the night of her late-night television debut. But before she can bite into the muffin that symbolizes her success, gunfire echoes through the TV studio. She’s just hidden herself (mostly in plain sight) when the door flings open. Instead of a gunman, there stands one of the world’s most popular rock stars, Gage Daxson, looking for his own way out of danger. Thrown together, they’ll battle a venomous man seeking revenge and his own sexual pleasure, but they may never leave the building again. Distracted by fear, fame, and infamy, can these two somehow find their way to each other? 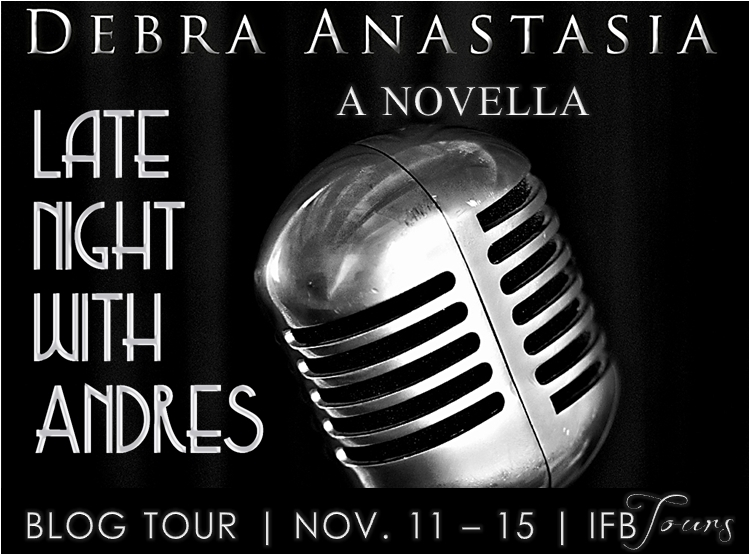 Equal parts horrifying and hilarious, Debra Anastasia’s Late Night With Andres offers more than a few twists and turns—and, of course, enough heat to keep things interesting. 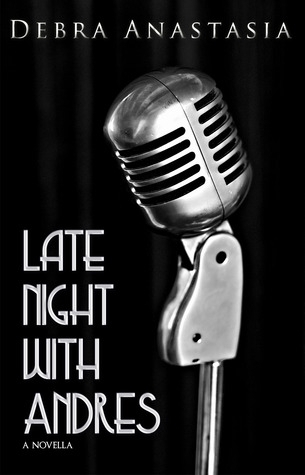 Late Night With Andres is classic Debra Anastasia, filled with blunt, dirty talk and lots of warmth, wit and heart. This novella will keep you totally entertained and wishing it was a full-length book. The story is fast-paced and a little out-there but is filled with modern social commentary, romance and one very hot rock star. Reading this book is a win-win for everyone because 100% of the proceeds are being donated towards breast cancer awareness. Grab a copy and get your fix of Debra Anastasia while waiting for the upcoming release of Return to Poughkeepsie! And thanks to the author, Omnific and all involved in this wonderful charity project! Debra Anastasia grew up in New York and got a bachelor’s degree in political science at SUNY New Paltz. At the start of her marriage, she moved to southern Maryland with her husband. She still doesn’t trust crabs and all their legs, though everyone else in her family thinks they’re delicious. Her favorite hobbies include knitting, painting furniture and wall murals, and slapping clowns. 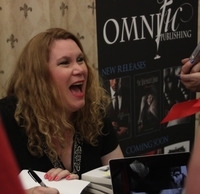 Her writing started a decent handful of years ago when along with the dogs, cat, kids, and husband, the voices of characters started whispering stories in Debra’s ear. Insomnia was the gateway for the plots that wouldn’t give up, wouldn’t let go. In the shower, a twist would take hold and–dripping and frenzied–she’d find somewhere, anywhere to write it down.